RCR Enterprises, LLC, doing business as Richard Childress Racing (RCR), is an American professional stock car racing team that currently competes in the Monster Energy NASCAR Cup Series and the NASCAR Xfinity Series. The team is based in Welcome, North Carolina, and is owned and operated by former driver Richard Childress. In the Cup Series, the team currently fields three Chevrolet Camaro ZL1 teams: the No. 3 full-time for Austin Dillon, the No. 8 full-time for Daniel Hemric, and the No. 31 part-time for Tyler Reddick. In the Xfinity Series, the team currently fields three Chevrolet Camaro teams: the No. 2 full-time for Tyler Reddick and the No. 21 part-time for Kaz Grala. RCR has had at least one car successfully qualify for every Cup race since 1972, the longest such active streak. In addition to its in-house Cup Series teams, RCR has several technical alliances and partnerships with other teams. In the MENCS, RCR is allied with Richard Petty Motorsports, Germain Racing, and StarCom Racing, while Kaulig Racing enjoys a technical alliance with RCR in the Xfinity Series. Beyond this, RCR also has collaborative agreements with Tommy Baldwin Racing, Beard Motorsports and Premium Motorsports, although these are not technical alliances. RCR has won NASCAR's Premier Cup Series championship six times, all with driver Dale Earnhardt, as well as the Daytona 500 three times; Earnhardt in 1998, Kevin Harvick in 2007 and Austin Dillon in 2018. RCR has also fielded cars for notables such as Jeff Burton, Mike Skinner, Ricky Rudd, Neil Bonnett, and Clint Bowyer. RCR debuted at the 1969 Talladega 500 as a 1968 Chevrolet numbered 13. Childress himself drove the car, finishing 23rd after suffering axle problems. In 1972, the team came back to run fourteen races with Childress driving again, but didn't go full-time until 1976 when he would begin using the No. 3. Childress earned eleven top-10 finishes and finished eleventh in points that year. Over the next few years, he posted many top-10s and twice was among the highest top 10 points earners, but he never was in serious contention to win. In 1981, he decided to end his career before the season ended, and handed his No. 3 ride to the defending Winston Cup champion, Dale Earnhardt, who brought his Wrangler sponsorship with him. After posting six-top tens, Earnhardt left to drive for Bud Moore, and Ricky Rudd took his place for the 1982 season, with Piedmont Airlines becoming the sponsor. Rudd drove the car for both 1982 and 1983 finishing 9th in points both years, and winning twice in the latter. But after the season was over, Rudd was replaced by Earnhardt, with Wrangler back as sponsor (in perhaps an odd twist of fate, Rudd moved to Earnhardt's old ride, the No. 15 Bud Moore Engineering Wrangler-sponsored Ford Thunderbird, which actually kept its sponsorship despite Earnhardt leaving. This time, Earnhardt was back for good, winning six championships over the next two decades, with crew chiefs Kirk Shelmerdine and Andy Petree, and Goodwrench replacing Wrangler as the primary sponsor after 1987. In the late 1990s Earnhardt's performance began to slow down, and went through 1997 without a victory. The next year, he won the Daytona 500 after 20 starts, all ending in losses. The year after that one, he was able to score wins at Talladega, as well as cause more controversy, after he spun Terry Labonte out to win a race at Bristol. In 2000, he looked like he was finally regaining his old form, winning twice and finishing runner-up to Bobby Labonte in points, and his many fans hoped he was gearing up for his record-breaking 8th championship. However, this was not to be. Austin Dillon (shown in 2015) took over RCR's flagship car in 2014. 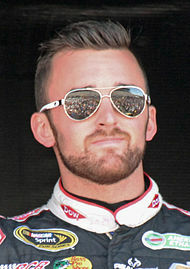 On December 11, 2013, Richard Childress announced that his eldest grandson Austin Dillon would replace Harvick for 2014 and contend for Rookie of the Year honors. In addition, the car was renumbered back to the 3, which had not been used since Dale Earnhardt's death, though RCR continued to pay for the rights to the number. New sponsor Dow Chemical and existing RCR sponsors General Mills, American Ethanol, Bass Pro Shops, and Realtree, came on to fund the return of the No. 3. Austin had run the number in prior competition, including championship seasons in the Truck and Nationwide Series, as did his younger brother Ty. The transition back to 3 has been met with mixed reactions, with some fans welcoming the move with open arms, and others turning their backs on RCR and even NASCAR as a whole due to accusations of disrespect towards the late Earnhardt, and that the number 3 should have been retired, despite the fact that Austin got blessing to drive the number from Dale Earnhardt Jr, Kelly Earnhardt, Kerry Earnhardt, and the long time friend and pit crew member of Dale Sr, Chocolate Myers. In addition to the return of the number 3, Austin was set to compete with what many deemed to be the strongest rookie class in the series' history, including talented youngster Kyle Larson and his runner-up for Nationwide Series ROTY Alex Bowman, Nationwide champion Justin Allgaier and Nationwide veteran Michael Annett, and former big team development drivers Parker Kligerman, Ryan Truex, and Cole Whitt. Larson and Dillon were viewed as the top contenders for the title. Dillon opened up 2014 with a bang, winning the pole at the season opening Daytona 500, then finishing ninth in the race after avoiding serious damage in a lap 145 wreck involving 13 cars. Though his results were not spectacular (one Top 5 and four Top 10s), Dillon's results were very consistent (0 DNF's),and finishing 20th in points, losing Rookie of the Year to Kyle Larson. In the 2015 Coke Zero 400 at Daytona on July 5, Dillon started on the outside of the front row after qualifying was rained out, and led the first eight laps. Coming to the checkered flag, Dillon was hit in the left front tire by the spinning car of Denny Hamlin, causing him to flip into the catchfence over two rows of cars. Dillon climbed out of the car unharmed, save for a bruised tailbone and a bruise on his forearm, but five fans were injured by flying debris. Dillon was credited with a seventh-place finish. Dillon ended 2015 with one top five and five top 10s, finishing 21st in points. Dillon started the 2018 season by winning the Daytona 500. The win coincided with the 20th anniversary of Earnhardt's Daytona 500 win and qualified Dillon in the Playoffs. Dillon, however, struggled to stay consistent throughout the season with two top-fives and five top-10 finishes. He was eliminated in the Round of 16 after hitting the outside wall twice at the Charlotte Roval race and finished the season 13th in points. What eventually became the No. 8 car at RCR was formed in 2001 as the No. 30 America Online-sponsored Chevrolet, with AOL signing a four-year contract. Childress initially planned to have Kevin Harvick drive the car on a limited basis during that season as part of a transition from the Busch Series to Winston Cup for 2002. After Dale Earnhardt's death, Harvick was moved into RCR's primary car and 2000 Busch Series champion Jeff Green was selected to drive the car in his place. Originally planning to debut at Atlanta in March, the team debuted at the NAPA Auto Parts 500 at California Speedway in April, with Green finishing 21st. The team qualified for six more races that season, with Green earning a pole at the Sharpie 500 at Bristol in August, and went full-time the next season as scheduled with Green behind the wheel. Green posted six Top 10s in the 2002 season, including a career best second at Loudon in July, and finished seventeenth in points. Although the team started 2003 with a Daytona 500 pole, Green and the team failed to jell as Childress had hoped and on May 5, was fired following the first race at Richmond. In what amounted to a trade between organizations, Green was replaced by the former driver of the No. 1 car for Dale Earnhardt, Inc., Steve Park, with Green taking Park's ride at DEI. Green's firing was largely connected to an altercation between him and teammate Kevin Harvick during the Richmond race in which Harvick wrecked Green while racing for a top 10 position, igniting an already tumultuous relationship between the two drivers that went back to their competition in the Busch Series. Park would score a pole at Daytona in July and earn two Top 10s but had only six finishes inside the Top 20, ending the season 32nd in points. In 2004, Childress promoted 25-year-old Busch Series driver Johnny Sauter to the ride, hoping he would rise to the occasion like Harvick had in 2001. Kevin Hamlin moved over from the 31 team to serve as Sauter's crew chief. Sauter had helped secure the 2003 Busch Series owner's championship in a partial schedule with RCR, while finishing 8th in driver points. Sauter failed to score a top ten, ranked at the bottom of the Raybestos Rookie standings, and was released just 13 races into the season. After that, Dave Blaney drove the car, only skipping Infineon Raceway when Jim Inglebright took the wheel. A couple of weeks after it was announced Blaney would be in the car for rest of the year, Jeff Burton became available after parting ways with Roush Racing's No. 99 car, leaving Blaney out in the cold. Burton was signed to a multi-year contract and drove the car for the rest of the year beginning at Michigan in August. When Robby Gordon left to start his own team, Burton moved to the 31. Clint Bowyer in the No. 07 car in 2007. Bowyer at Daytona in 2008. With AOL leaving as sponsor, Childress had two voids left to fill. He decided to rehire Blaney, and signed Jack Daniel's to sponsor the car, marking one of the first hard liquor sponsorships in NASCAR's history. The team also changed its number to 07 to commemorate JD's slogan "Ol' No. 7". Blaney posted just 2 top ten finishes during 2005, finishing 26th in the standings. As a result, Blaney moved to Bill Davis Racing in 2006, while rookie Clint Bowyer was placed in the No. 07 Jack Daniels Chevrolet for RCR. In his second season, Bowyer took the first win for this team at the Sylvania 300 at Loudon. Bowyer finished third in the final standings in 2007. In 2008, Bowyer got his second win at Richmond at the Crown Royal Presents The Dan Lowry 400, and finished fifth in points. On August 23, 2008, former Hendrick Motorsports driver Casey Mears was signed to drive the 07 in 2009, with Bowyer moving to the fourth RCR car, the No. 33. Mears struggled in the new ride, however, and had to take on three crew chiefs during the season. 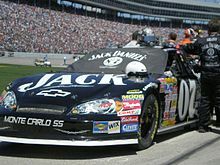 More troubling was the fact that Jack Daniel's announced on September 21, 2009 that they would be leaving RCR at the end of the year, leaving the 07 without a sponsor. Childress decided to release Mears at the end of the year, and sell the 07's owners points to Furniture Row Racing. On August 11, 2010, Paul Menard was signed to drive a fourth RCR Chevrolet after he decided to leave the struggling Richard Petty Motorsports. The car was re-numbered to 27, and MENARDS Home Improvement, owned by Paul's father John Menard, came on to sponsor the car in a multi-year agreement. Former TRG Motorsports partner Tom Pumpelly was listed as the owner of the No. 27 and the No. 35th place owner's points were given to Menard to guarantee a spot in the first five races. The 27 opened the season with a 9th-place finish at the Daytona 500. Menard would go on to win the Brickyard 400 at the Indianapolis Motor Speedway on July 31, leading four times for a total of 21 laps and using a fuel mileage gamble to take the victory. It was the first career win for Menard, and his father's first win at the track as an owner or sponsor in both NASCAR and IndyCar competition. The victory also made Paul eligible for the $3 million Sprint Summer Showdown. Menard spent most of the season flirting with the top 12 in points. Menard and the 27 team would end up finishing 17th in points. In 2012 and 2013, Menard's results were similar, scoring 9 top 10s in both seasons and finishing 16th and 17th in points respectively, with only three DNF's over the two years. At the 2013 season finale at Homestead Miami Speedway, Menard was involved in a freak incident, when his right rear wheel caught fire due to rubber from a previous tire issue being wrapped around the rear axle and igniting from a cut brake line. The tire proceed to explode on pit road, sending black smoke in all directions, and ending their day. ESPN analyst Andy Petree described it as "like a bomb went off" during the telecast of the race. In a less infamous incident at Darlington in April of the next year, Menard blew a right front tire and slammed the turn 2 wall. Once again on pit road, rubber collected under the car (in addition to fluid leaking from the engine) caught fire and exploded, ending the 27 car's race. Menard returned to the 27 for 2014, with the car running schemes more oriented towards the associate sponsors of MENARDS featured on the hood of the car. Six races prior to the Chase for the Sprint Cup at Indy in July, Menard was involved in an incident with part-time driver Juan Pablo Montoya, sending Menard into the turn 3 wall and relegating him to a 34th-place finish. The incident upset both driver and crew (Menard was dropped to 16th in points). After the fall Richmond race, Menard remained winless and ranked 20th in points. Menard made his first chase appearance in 2015, but got eliminated after the first round and finished 15th in the final standings. After two mediocre seasons, (25th in 2016, 23rd in 2017), Menard left the team to go race for Wood Brothers Racing for the 2018 season. The No. 27 team was shut down after the 2017 season, with the team's charter being leased and eventually sold to StarCom Racing. The No. 27 team returned to 2018, but as the No. 8 running part time with Daniel Hemric making his Cup series debut at the spring Richmond race and the Charlotte Roval race. The car was sponsored by Smokey Mountain Herbal Snuff, who sponsored Hemric in four races of the 2017 Xfinity Series season. Hemric finished 32nd at Richmond and 23rd at Charlotte. It was announced on December 14, 2018, that the No. 31 team would be changing numbers to No. 8 for the 2019 season. 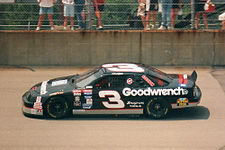 Following Dale Earnhardt's death on the last lap of the 2001 Daytona 500, Childress changed the number of the car from 3 to 29 (the lowest car number available at the time), inverted the original paint scheme, and tabbed his 25-year-old Busch Series driver Kevin Harvick to drive it. Harvick originally was scheduled to drive the No. 30 car part-time before going full-time in 2002; but the death of the 7-time Winston Cup champion rushed Harvick into the spotlight. In just his third Winston Cup start, Harvick beat Jeff Gordon by mere inches (.006 seconds) to win the Cracker Barrel 500 at Atlanta Motor Speedway, dedicating the win to Earnhardt. After posting another win at Chicagoland Speedway, Harvick won NASCAR Winston Cup Rookie of the Year honors. In 2002, his infamous temper escalated after announcing on his radio he would intentionally wreck another driver during a Craftsman Truck Series race. In response, NASCAR benched Harvick for the next race, and was replaced during that time by Kenny Wallace. Since then, Harvick has won eight races, including the prestigious Brickyard 400 and Daytona 500 while scoring a (at the time) career-best points effort of 4th in both 2006 and 2008. Despite a win early in the season, with 14th-place efforts proved to be frustrating, as Harvick threatened to leave the team if performance did not improve. A series of strong runs near the end of 2005 seemed to satisfy him, however, and he was back in the car in 2006 with Reese's as a new co-primary sponsor. After a somewhat slow start, Harvick hit his stride in April, with a string of Top 10 finishes, including a win at Phoenix. This helped RCR to be a dominant force in NASCAR again. After weeks of speculation as to where Kevin would drive starting in 2007, he and RCR announced a new three-year deal that he would drive for him until 2009. For 2007, the team had a significant change in sponsorship. GM Goodwrench would move to an associate sponsor role on the No. 29, while Shell Oil Company and Pennzoil took over the primary sponsorships. Harvick's 2007 season started out on a high note with a win in the Daytona 500 in a close finish with veteran Mark Martin. Harvick would score another win at the All-Star Race, holding off Jimmie Johnson. Harvick entered a slump during the summer, and was involved in a trackside altercation with Juan Pablo Montoya. However, Harvick and his team held off a struggling Dale Earnhardt Jr. to make the Chase for the Cup. Harvick's Chase performance would not be a repeat of 2006, and he would finish 10th in the points. Harvick won the 2009 Budweiser Shootout and finished second in the Daytona 500. Harvick in the 2013 STP Gas Booster 500 at Martinsville Speedway. One of Harvick's final runs with RCR, in a black & red Rheem Chevy in 2013. After not making the 2009 Chase for the Sprint Cup, it was expected that Harvick would leave RCR after his contract ends at the conclusion of the 2010 season. However, after a strong start to the 2010 season, winning the 2010 Aaron's 499 at Talladega and the Coke Zero 400 at Daytona, Harvick signed a multi-year extension to his RCR contract in May 2010. Harvick went on to finish third in the championship for the 2010 season, the highest finish of his career. The team's sponsor, Shell Oil Company and Pennzoil, left after the 2010 season and joined Penske Racing. Budweiser replaced it as the car's primary sponsor beginning in the 2011 season. Harvick and the 29 team recorded three wins early in the year at Fontana, Martinsville, and Charlotte. The team's consistency kept them near the top of the standings, and they recorded a fourth win at the 26th race in Richmond. Despite the team's Chase performance being inconsistent, Harvick would finish third in points for the second year in a row. For 2012, Harvick was reunited with Shane Wilson as his crew chief at Harvick's request. However, after struggling for most of the season, Childress reunited Harvick with Martin. Harvick won once that year with Martin at Phoenix International Raceway. Despite rumors that he would leave RCR for Stewart-Haas Racing after the 2013 season, the 29 team racked up 4 wins during the season, and once again finished third in points. Harvick would later announce his departure from RCR to Stewart-Haas midway through the season, taking sponsors Budweiser and Jimmy Johns with him. For over a decade, car No. 31 was Childress's R&D car. It debuted in 1988 at the fall event at North Carolina Speedway, as No. 22 and Rodney Combs driving, finishing dead last. Ironically, when Bill Elliott's backup car failed during practice for the pit crew championship, Elliott drove that backup car for his No. 9 team to do the competition pit stop. The car wasn't seen again until 1993, as No. 31 and Earnhardt's longtime friend Neil Bonnett driving at Talladega Superspeedway. In this race, Bonnett, already on a comeback, was involved in a horrifying accident, but made it out okay. After driving another race in the season finale at Atlanta Motor Speedway as a start and park entry that year for RCR, Bonnett died testing Phoenix Racing's No. 51 Country Time Lemonade car for the 1994 Daytona 500. Mike Skinner, the first full-time driver of the No. 31, in 1997 with the Lowe's scheme he ran until 2001. Mike Skinner races the No. 31 Chevrolet in the 2000 Coca-Cola 600. In 1996, the car returned with defending Craftsman Truck Series champion Mike Skinner driving with Realtree sponsoring the car in four of the five races it ran. Skinner had three top-ten starts that year, including one on the outside pole. The team finally ran full-time in 1997, with Skinner driving and Lowe's signing a five-year deal to sponsor the entry. The move made RCR a multi-car operation for the first time. Skinner won the pole position for both of the races at Daytona, and defeated what has turned out to be a very scant field of drivers for Rookie of the Year. He suffered some injuries in 1998, and Morgan Shepherd and Childress' son-in-law Mike Dillon filled in for him. Teamed with crew chief Larry McReynolds, 1999 was his best season ever, winning the pole position twice, and finished tenth in points after being the championship leader at one point earlier in the year. Skinner would finish 12th in points in 2000, earning his career-best finish of second at Talladega. However, Skinner was never able to win a points-paying race, although he won two exhibition races in Japan, at Suzuka and Twin Ring Motegi, respectively, as well as some other non-point events. Robby Gordon in the No. 31 Cingular Chevy at PIR in 2004. All three of Robby Gordon's Cup wins came in the No. 31. For the 2001 season, McReynolds was replaced by Royce McGee. In 2001, Skinner suffered a concussion and a broken ankle in an early race crash at the inaugural race at Chicagoland in July. Robby Gordon was named his replacement in the No. 31 car. Gordon struggled heavily, missing two races and failing to post a finish better than 25th in his first four starts for the team. During this time in August, Cingular Wireless (then the sponsor of Chip Ganassi Racing's No. 01 car) was announced as the new sponsor for 2002 signing a four-year deal, with Lowe's not renewing their contract and moving to Hendrick Motorsports. Skinner returned at Bristol, but he just wasn't the same. Skinner was released from the final year of his contract in August, and left the team after Dover in September to have season-ending surgery. Gordon once again took his place at Kansas. At Watkins Glen, Gordon was dominating the second road course race of the season when the telemetry box in his car used by NBC Sports burst into flames, injuring a crew member and ending the No. 31's day. In spite of struggles, it was announced in November 2001 that Gordon would drive the car full-time the next year. In the rescheduled season finale at New Hampshire, Robby Gordon was engaged in a closing-laps battle with eventual champion Jeff Gordon (no relation). With 16 laps to go, leader Jeff Gordon (who ended up leading 257 of the 300 laps) was stuck behind the 12th-place No. 77 car of Robert Pressley trying to stay on the lead lap, with Robby right on his tail. In the middle of turns three and four, Robby gave a bump to Jeff Gordon while he had slowed down to try to pass the lapped car of Mike Wallace, sending him into Wallace's No. 12 car and inflicting damage on the 24 car. Jeff was black-flagged while attempting to retaliate under caution, and Robby went on to earn a controversial first career victory. It was also the 31 car's first victory. Armed with a big surge of momentum and a new sponsor in Cingular Wireless, Gordon had five top-ten finishes and finished 20th in points in 2002. 2003 was even better, as he swept both road course events and improved four spots in points. After his performance dipped down in 2004, Gordon decided to leave and start his own team, the No. 7 with Robby Gordon Motorsports, and Jeff Burton was tabbed as his replacement. 2005 was Jeff Burton's first full year at RCR, and he had six top-tens and three top-fives for the year, including a third in the Subway Fresh 500 at Phoenix in April and a second-place finish in the Sharpie 500 at Bristol Motor Speedway. In 2006, Burton won the pole for four races, bringing his total number of career pole wins to six. The four pole wins were for the Daytona 500, the USG Sheetrock 400 at Chicagoland Speedway, the Brickyard 400 at Indianapolis Motor Speedway, and the GFS Marketplace 400 at Michigan International Speedway. Prior to qualifying for the Daytona 500, Burton was extremely enthusiastic about the improvements to RCR as a whole. The Allstate 400 pole gave Richard Childress Racing the front row as teammate Clint Bowyer recorded the second fastest time. Burton's best finish came in the Chicagoland race where he recorded a second-place finish. He led the most laps at Indianapolis and Bristol's Sharpie 500, setting the pace for more than half the race. In the Busch Series, he won at Atlanta Motor Speedway and Dover International Speedway, breaking his four-year winless streak in any series. Burton won the Dover 400 at Dover International Speedway allowing him to take the points lead. However, a series of relatively poor finishes in subsequent races, including a flat tire at Talladega while running in the top five and an engine failure at Martinsville, eliminated Burton from contention for the championship. Burrton won the Samsung 500 (Texas) on April 15, 2007, driving the Prilosec OTC-sponsored Chevrolet, passing Matt Kenseth on the final lap, making him the first driver with multiple wins at Texas Motor Speedway. he finished tied for 7th in the 2007 standings. Burton came very close to winning the 50th running of the Daytona 500. He qualified 36th and by the end of the race had worked his way up in the field. He led prior to the race's final caution, but when the green flag dropped with four laps to go, lost several positions and wound up finishing 13th. Burton won the 2008 Food City 500 at Bristol Motor Speedway. Following contact between Kevin Harvick and Tony Stewart, Burton passed both Harvick and Stewart for the 2nd position. On the ensuing restart Burton passed Denny Hamlin coming off of Turn 2 to win the Food City 500 and finishing off a sweep of the podium for Richard Childress Racing. Burton also won the 2008 Bank of America 500 at Lowe's Motor Speedway. Burton took the lead from Greg Biffle with just over 70 laps to go. During the final round of pit stops Burton took fuel only and held off a hard charging Jimmie Johnson for his first multiple win season since 2001. Burton had a new sponsor on the No. 31 beginning in 2009, after Caterpillar Inc., his brother Ward Burton's former sponsor at Bill Davis Racing, was signed through 2011. Burton was expected to make a run for the championship. Burton's best finish that year was a pair of second-place finishes in the final two races at Phoenix and Homestead. In 2010, he rebounded but he had still not won a race, he finished second in both Dover races. He nearly won the fall Martinsville but a flat tire with 15 laps to go gave Denny Hamlin the win. A couple weeks later he and Jeff Gordon got into a wreck long after the caution was out. Burton walked up the track to confront Gordon and the two got into a shoving match. Burton finished 12th in the final standings. Afterwards, Burton assumed responsibility for the incident, stating he was attempting to catch up to Gordon, but was unable to see in the sunlight's glare. In 2011, Burton opened the season by winning the second Gatorade Duel qualifying race, edging out his Richard Childress Racing teammate Clint Bowyer. After that, Burton's season went downhill. He was leading the Daytona 500 halfway when his engine gave out. He nearly won the Coca-Cola 600 but got spun out on the final restart. Though wanting another caution, the yellow flag never came out because NASCAR wanted to see the race finish under green, and Dale Earnhardt Jr. was leading when the accident occurred. His teammate Kevin Harvick passed Earnhardt Jr. within the last 500 yards of the race, because Dale Jr. ran out of gas. This led to controversy because fans were speculating that NASCAR wanted Earnhardt to win and go back to victory lane in the first time in three years. Burton's first top 10 came in the twenty first race at Watkins Glen International. Burton had a strong run at the fall race at Talladega, leading on the last lap and out of turn four being pushed by Clint Bowyer. At the tri-oval, Bowyer slingshotted to Burton's outside and won by a hood, giving Richard Childress his 100th win as a team owner, Bowyer redeeming his 0.002 second loss to Jimmie Johnson at the track in the spring. In 2012, Burton gained the sponsorship in Wheaties, BB&T and EnerSys. The 31 team also switched crew chiefs too, and Drew Blickensderfer became the crew chief. After a dismal 2012, Blickensderfer was released 4 races early and Luke Lambert became Burton's crew chief in 2013. Shane Wilson became interim crew chief until the end of 2012. Burton had six Top 10s in 2012 including a dramatic 2nd-place finish at Daytona in July after saving his car from spinning on the final lap. At the AdvoCare 500 at Phoenix International Raceway, Burton would make his 1,000th career NASCAR start, the sixth driver in NASCAR history to do so. On September 4, 2013, Richard Childress Racing announced that Burton would not be returning to RCR in 2014. In September 2013, Burton announced that he would be stepping out of the No. 31 at the end of the season due to a lack of additional sponsorship. On September 9, it was announced that Ryan Newman will drive the No. 31 beginning in 2014, bringing sponsor Quicken Loans with him from Stewart-Haas Racing for 12 races. Kevin Harvick had transferred to Stewart-Haas Racing, Newman's previous team, essentially meaning the two drivers were switching teams, although they did not end up in the same rides. In 2015, Newman had a productive season. He picked up a few top fives in the spring, but his season changed. After the 2015 Auto Club 400, Newman's team was penalized with one of the harshest penalties ever. Key members of his team including Lambert were suspended for six races and fined $75,000 and stripped of 75 driver and owner points for having intentionally altered their tires. Newman appealed the penalty which got slightly reduced on appeal but the suspensions were upheld. Newman struggled throughout the 2016 season, only managing 10 top tens and 2 top fives. He finished off the season with a poor 25th-place finish at Homestead Miami Speedway. Newman finished 11th in the 2016 Daytona 500. This was an improvement from 2015's finish which was a 38th-place finish. In 2017, RCR re-signed Newman to a multi-year contract. On March 19, 2017, Newman won at Phoenix, breaking a four-year winless streak for himself and a nine-year winless streak for the No. 31 team. The team, however, struggled throughout the 2018 season, failing to make the Playoffs and finishing 17th in the points standings. On September 15, 2018, Newman announced he will not return to RCR in 2019. In September 2018, RCR announced that newcomer Daniel Hemric will race full-time in the No. 31, replacing Newman beginning in 2019 while competing for 2019 Rookie of the Year honors. On December 14, 2018, it was announced that the No. 31 car would be changing to No. 8 starting with the 2019 season. In February 2019, RCR announced that the No. 31 would enter in the Daytona 500 with the car being driven by rookie Tyler Reddick. What is now the No. 33 car started as the No. 90 car in 2003. RCR entered the No. 90 Chevrolet in the fall Talladega race with John Andretti driving. The car was sponsored by AOL 9.0 and was numbered 90 for marketing purposes. Ron Hornaday, Jr. ran the No. 90 in the season-ending Ford 400 with Childress Vineyards on the hood. In 2004, it was announced that Kerry Earnhardt would drive the car (renumbered to 33) in five NASCAR Nextel Cup races. Mike Skinner would run the car in the Daytona 500, finishing 22nd. Earnhardt drove the car in the other three restrictor plate races with Bass Pro Shops sponsoring, getting his best finish of 24th. He attempted all of the restrictor plate races again in 2005, finishing 17th at Talladega. In addition, road course ringer Brian Simo brought home a 10th-place finish at Infineon Raceway. Clint Bowyer (Childress' Busch Series driver) made his Nextel Cup debut in this car with a Sylvania sponsorship at Phoenix in April 2005. Scott Wimmer ran the season finale in 2005, attempted two races in 2006 (making one start), and only made one start out of seven attempts in 2007. On May 2, 2008, Wimmer attempted but failed to qualify for the 2008 Crown Royal presents the Dan Lowry 400 at Richmond. Wimmer had sponsorships from Holiday Inn and Camping World/RVs.com. Ken Schrader and Mike Wallace ran one race apice in 2008. RCR expanded to 4 full-time Monster Energy NASCAR Cup Series teams in 2009 with sponsorship from General Mills' Cheerios and Hamburger Helper sponsorships on the No. 33 Chevrolet. On August 23, 2008, RCR driver Clint Bowyer was announced as the driver of the No. 33 General Mills-sponsored Chevrolet Impala SS for the 2009 season. Casey Mears took over Bowyer's previous car, the No. 07 Jack Daniel's-sponsored Chevrolet Impala SS. In his first race in the car, Bowyer finished fourth in the 2009 Daytona 500. However, the team failed to win in 2009. The Hartford joined the team as an additional a sponsor of the No. 33 during 2010, and Bowyer's consistency improved markedly. The team had a fairly solid season in 2010. However, in 2011, the team struggled with consistency. With the departure of Bowyer to Michael Waltrip Racing for 2012, General Mills moved its sponsorship over to the No. 31 team, leaving the No. 33 team without a driver or sponsor. Brendan Gaughan at Las Vegas in 2012. The No. 33 began 2012 with the intent of running only as long as sponsorship would allow. Kroger and General Mills sponsored at the Daytona 500 with Elliott Sadler driving. Brendan Gaughan drove the next four races with his family's South Point Hotel, Casino & Spa on the car. Elliott's brother Hermie Sadler then drove at Martinsville with Anderson's Maple Syrup sponsoring. This would be the last race for the 33 under RCR control, fielded as a collaboration with the new team ownership (see below). In April 2012, Childress announced that he sold the No. 33 to Joe Falk and Mike Hillman, Sr., who had fielded the No. 40 twice earlier in the season but had yet to qualify for a race. However, they kept the number 33, with the team assuming the name Circle Sport. Falk and Hillman took over the car at Texas in April. The transfer allowed RCR to field the number for their entries on limited occasions. In the first of these occasions, Austin Dillon ran the car under the RCR banner with American Ethanol, finishing 24th at the June Michigan race. For 2013, the same arrangement continued, with Dillon running the No. 33 as an RCR entry for selected races including Daytona, Michigan, and Indianapolis. Brian Scott ran an RCR car in his Cup debut at the 2013 Bank of America 500, finishing 27th. In 2014, RCR ran the 33 in the first two races of the season with Scott and his family's Whitetail Club. Scott finished fifth in his Daytona Duel to earn a spot in the Daytona 500, then finished 25th in the race after several accidents. Scott ran the next race at Phoenix, starting and finishing 32nd. Scott was involved in a controversy in the fifth race of the season at Fontana, when he spun out Monster Energy NASCAR Cup Series Series regular Aric Almirola, who expressed displeasure at Scott's driving and source of sponsorship after getting out of the car. Scott would finish 35th in that race. Brian then won the pole at the spring Talladega race, his first career Cup pole. Scott would not lead any laps, however, and finished 42nd after crashing out. 2000 Cup Champion Bobby Labonte, who was doing test driving for RCR, drove the same car at the summer Daytona race, under the Circle Sport banner. The car again had speed in qualifying, timing in 4th. Labonte would contend for the lead for much of the race but finish 26th after being swept up in the Big One. Richard Childress' younger grandson Ty Dillon drove at Atlanta and Phoenix in the fall, with sponsorship from Rheem, Realtree and Charter Communications. Ty Dillon attempted the 2015 Daytona 500 in the No. 33 for RCR with Cheerios and Kroger sponsoring. Dillon qualified for the Daytona 500 and finished 28th. Brian Scott qualified for Atlanta in the No. 33 (under the Circle Sport banner) the next week, but gave up his seat to HScott Motorsports after their driver Michael Annett missed the race. Under NASCAR rules, Falk would receive owner's points. Scott raced the next week at Las Vegas for RCR, finishing 13th, and also ran well two races later at Fontana before finishing 27th. Scott made the field at Talladega in May, but finished last after a blown engine and subsequent crash collecting Michael Waltrip. Dillon ran the car at Kansas in May promoting SpongeBob SquarePants character Plankton. Scott drove the car at Dover with Acme Markets and Kraft, finishing 36th after a crash with Kyle Busch. Dillon returned at Pocono and Michigan in June with Yuengling and Nexium sponsoring in respective events. Scott returned with Shore Lodge at the July Daytona race and the Brickyard 400. The 33 shut down at the end of the season. Austin Dillon made his Monster Energy NASCAR Cup Series debut at Kansas in October 2011, with sponsorship from Camping World on the No. 98 Chevrolet. The car was fielded in association with music executive Mike Curb and promoted the Ronald Reagan Centennial Celebration. The entry was allowed because of NASCAR's policy that allows teams to field a fifth car if it is fielded for a rookie in seven or less races. RCR has fielded this entry in the Nationwide Series since the fall North Carolina Speedway race in 1999, moving the entire team from the Craftsman Truck Series. Kevin Harvick was the first driver of the No. 2 AC Delco-sponsored Chevy, winning three races and winning Rookie of the Year along with a third-place points finish, despite missing the spring race at North Carolina Speedway. He went on to win the championship in the Busch Series in 2001 while running full-time in Winston Cup as well. In 2002, rookie driver Johnny Sauter won at Chicagoland and finished 14th in points. The next year, Ron Hornaday drove the car full-time, winning one race and posting a third-place finish in points. He followed up that performance with another win and a drop to fourth in points the following year. Hornaday was not re-signed for 2005. In 2005, Clint Bowyer took the wheel, in a program headed up by veteran crew chief Gil Martin, winning at Nashville Speedway and Memphis Motorsports Park to finish second in points. Bowyer was back in the No. 2 car in 2006 with crew chief Dan Deeringhoff, while Martin moved up to run the No. 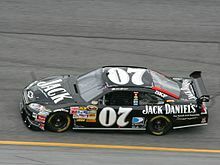 07 Jack Daniels-sponsored Cup car for Bowyer's rookie season. Bowyer would finish 3rd in points with a win a Dover. 2006 was the final year for longtime sponsor AC Delco (sister company GM Goodwrench also withdrew from the Cup Series after 2006); for 2007, BB&T signed on as the sponsor, with Bowyer running 21 races in the No. 2. Kenny Wallace drove for the team in a one-race deal at Gateway International Raceway, with a sponsorship from sandwich chain Jimmy John's. In 2008, Bowyer returned full-time, scoring 18 Top 10s in the first 21 races including a win at Bristol. In 2009, the No. 2 team ran a partial schedule with Sean Caisse and Austin Dillon sharing the ride. The team shut down after 2009. Elliott Sadler moved over from KHI in 2012, winning four races. In late 2011, Kevin Harvick sold off his KHI organization, with the Nationwide Series team and equipment going to Childress' stable. KHI's 2 car, driver Elliott Sadler, and sponsor OneMain Financial moved over to RCR. Sadler continued on the success from KHI, finishing second in the 2012 drivers championship for the second year in a row to Ricky Stenhouse, Jr. Even though Sadler scored four wins, it was announced in September that he turned down an extension offered by Childress to continue in the second tier series; he and sponsor OneMain Financial moved to Joe Gibbs Racing in 2013, which included a start in the Cup Series. Brian Scott at Road America in 2014. For 2013, former JGR driver Brian Scott took the wheel of the No. 2 under a multi-year contract (essentially swapping rides with Sadler). He brought sponsorship from the Idaho-based Shore Lodge and Whitetail Club, owned by his father. The No. 2 team also switched back to RCR-style angled number logos from KHI-style logos. Scott had markedly improved consistency from his crash-marred seasons with Gibbs, with three Top 5s and 13 Top 10s en route to a seventh-place points finish. Scott's best run by far was at Richmond in September, where he led won the pole and led 229 laps. before being passed on the restart by Brad Keselowski with 11 laps to go, finishing second. Scott's team protested the restart-in-question, and after the race stated "We deserved to win that race." In the spring Richmond race, Scott and Nelson Piquet, Jr. got into altercations on the cool down lap and on pit road following several on-track incidents that carried over from prior races. During the physical altercation, which got both teams' crew members involved, Piquet was shown kicking Scott in the groin, which Scott called "just a chicken move." Scott finished 20th in the race. Scott returned RCR in 2014, which included several starts in the No. 33 Cup car. Scott's performance continued to improve, winning another Richmond pole (in the Spring race), poles at both Chicagoland races, and was in contention to win several races. Scott ended the year with career bests in Top 5 finishes (six), Top 10s (23), and average start and finish (6.5 and 9.5 respectively). He would come away with a career-best fourth place in the championship standings, losing a numerical tiebreaker for third with former RCR driver Elliott Sadler. For 2015, Scott returned to the No. 2 Camaro, with Mike Hillman, Jr. replacing Phil Gould as crew chief. Scott left the team for Richard Petty Motorsports in Cup Series at the end of the season. In 2016, the No. 2 began fielding variety of drivers driving including Austin Dillon and Paul Menard, with sponsorship from Rheem and Menards. Dillon and Menard would run 27 races combined, with the former winning at Auto Club and the fall Bristol race. Sam Hornish, Jr., Ben Kennedy, Michael McDowell, and Regan Smith would also round out the No. 2 lineup. Hornish would win the spring Iowa race, while McDowell would take his first NASCAR victory at Road America. The 2 team would finish 6th in owners points. For 2017, Dillon and Menard continued to run the No. 2 Camaro. On October 5, 2017, it was announced that Matt Tifft will be the driver of the No. 2 car in 2018 and compete for the NASCAR Xfinity Series Championship. Austin Dillon won the 2013 Nationwide Championship. The No. 3 car was initially run in the then-Busch Series by Dale Earnhardt, Inc. beginning in 1989, winning two back-to-back championships with Dale Earnhardt, Jr. in 1998 and 1999. The No. 3 made its debut as part of the RCR stable in 2002 at the EAS/GNC Live Well 300 at Daytona, driven twice that year by Earnhardt, Jr. with sponsorships from the Nabisco brands Oreo and Nilla. Earnhardt won the Daytona race but finished 36th at the Carquest Auto Parts 300 at Charlotte after being involved in a crash. The No. 3 car returned for one race in 2010 at the Subway Jalapeño 250 at Daytona with a sponsorship from Wrangler, in a joint venture between RCR, JR Motorsports, and Dale Earnhardt, Inc. The car was once again driven by Earnhardt, Jr. with a paint scheme resembling the one used by his late father when he first drove for RCR. Earnhardt would go on to win the race, his first victory in 87 Nationwide Series starts, and the first victory in a Nationwide Car of Tomorrow. Prior to the start, Earnhardt, Jr. claimed that it would most likely be the last time he would drive the No. 3 car. In 2012, the team moved to full-time status with Childress's grandson Austin Dillon driving, led by crew chief Danny Stockman. The team had a sponsorship from AdvoCare for 20 races, and Bass Pro Shops and American Ethanol for the others. Dillon stayed in the championship hunt throughout the season, sweeping both Kentucky races and easily claiming Rookie of the Year. Dillon would finish third in points behind teammate Elliott Sadler and champion Ricky Stenhouse, Jr. Dillon returned in 2013, with a sponsorship from AdvoCare covering the entire season. Despite not going to victory lane, the No. 3 team scored five consecutive poles midway through the season and seven total on the year. Dillon managed to stay consistent enough to beat Sam Hornish, Jr. for the championship, becoming the first team to win a championship without a victory. Austin would move up to the Monster Energy NASCAR Cup Series in 2014. For 2014, younger brother Ty Dillon took over the No. 3 for 2014 with sponsorships from Yuengling, Bass Pro Shops, and WESCO. Dillon earned a pole in the third race of the season at Las Vegas, and scored his first career victory at the famed Indianapolis Motor Speedway after leading 24 laps, one of only three rookies to win a race in 2014. Dillon earned three poles, seven Top 5 finishes, and 24 Top 10 en route to a fifth-place points finish, losing Rookie of the Year honors to champion Chase Elliott. He followed it up with a career-best 3rd place in points for 2015 and 5th place in 2016 despite not winning a race either year. The No. 21 debuted in 2000, with Rockwell Automation as the sponsor and Childress' son-in-law Mike Dillon as the driver. Dillon posted two Top 10 finishes and finished 23rd in points that year. Six races into 2001, he was injured at Bristol Motor Speedway and it was announced at the time he would be out for the rest of the season. Since then, he has taken on other roles with the team. His replacement was Mike Skinner but after his injury, Jeff Purvis briefly took over, winning at Pikes Peak, before Skinner returned. After Skinner's release, Robby Gordon had the driving duties for the balance of the season. The next year, Jeff Green and Jay Sauter drove the car. In 2003, the team set out to win the Busch Series Owner's Championship with a sponsorship from The Hershey Company's PayDay brand. Cup Series driver Kevin Harvick was tabbed to drive 15 of the 34 races, with development driver Johnny Sauter filling out the rest of the schedule. Harvick ended up competing 19 races, with three wins and Top 10s in all but one race, and RCR became the first team to win an owner's points title with two different drivers. Harvick would serve as the team's anchor driver there afterwards, with Clint Bowyer doing the co-driving honors in 2004 and Brandon Miller in 2005 and sponsorships from Reese's Peanut Butter Cups. Jeff Burton drove the car at Bristol in 2005. In 2006, Harvick and Burton split the driving duties in the car with sponsorship from United States Coast Guard, as Harvick attempted to run the entire Busch Series schedule in three different cars. Burton won at Atlanta, and Harvick won three more races, pulling out to an over 700-point lead in the points standings with five races to go in the 2006 season. AutoZone replaced the sponsorship with Coast Guard in 2007, and Harvick drove along with development driver Timothy Peters, until Peters was replaced by dirt late model driver Tim McCreadie. Beginning in 2008, Bobby Labonte was tapped to drive the 21 car for 15 races of the season. In May 2008, the team shut down due to financial problems but returned at the Emerson Radio 250 to debut Austin Dillon, son of former driver Mike Dillon and grandson to Richard Childress. In 2010, RCR hired John Wes Townley as driver of car No. 21, with family-owned Zaxby's as the sponsor. On April 9, Townley was pulled from the No. 21 car after a practice crash at Phoenix, which had proceeded an arrest for possession of alcohol as a minor. RCR said the move was for precationary reasons, but Townley never returned to the team and would return to his former team RAB Racing. Clint Bowyer took over driving duties at Phoenix, and Scott Riggs drove at Nashville and Kentucky in June. Zaxby's, meanwhile, scaled back to sponsoring 21 of the season's 35 races. After the July Daytona race, Morgan Shepherd stepped behind the wheel for several weeks, taking a break for Bristol to handle his own car for Faith Motorsports, which didn't make the field. RCR and Shepherd formed Shepherd Racing Ventures on August 31 to keep the No. 21 running the rest of the year. Bowyer drove with the Zaxby's sponsorship at Atlanta, Richmond, Charlotte, and Texas while Shepherd drove without a sponsor for the other seven races. Following the season, Shepherd returned full-time to his Faith Motorsports operation with RCR transferring the No. 21 owners points to Shepherd, while RCR shut the 21 team down. In 2011, RCR briefly restarted its Nationwide program, running a few races with development driver Tim George, Jr. and sponsorship from Applebee's. In 2012, the No. 21 ran at Charlotte and Homestead with Joey Coulter. The car returned in 2013 with Dakoda Armstrong, Brendan Gaughan, and Kevin Harvick driving, taking a best finish of fifth at Indianapolis. It was announced that Daniel Hemric will drive the No. 21 for 2017. The No. 29 car in 2007. The 29 car first appeared in 2002, with Kevin Harvick (driver of the 29 Cup Series car) running four races with sponsorship from GM Goodwrench, Action Racing Collectibles, Sonic, and Sylvania. Jim Sauter also made his final career start at the Milwaukee Mile with Rockwell Automation and Nilfisk-Advance sponsorship, racing as a teammate to his sons Jay and Johnny and against his other son Tim. The car appeared again in 2003 at Homestead-Miami Speedway with Johnny Sauter driving and the PayDay sponsorship, as a thank you from Richard Childress for Sauter's help in winning the 2003 owners' championship for the 21 team. The 29 car returned in 2005 at Bristol Motor Speedway as part of a promotion for Reese's Chocolate and Peanut Butter Lovers Cups. The promotion involved the 29 painted as the Chocolate Lovers car and the 21 painted as the Peanut Butter Lovers car. The plan was for Jeff Burton to drive the 29 while Kevin Harvick would drive the 21. Qualifying was rained out, so the entries were switched to assure that both cars would make the field (Harvick was a past champion and the No. 29 was not locked in). Burton drove the 21 while Harvick drove the 29. Harvick won the race in this car with Burton finishing second in the 21. Later in the season, Mayflower Transit came on to sponsor Burton after a seven-year relationship with him. 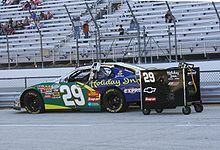 On March 17, 2006, Holiday Inn announced its sponsorship of the 29 for ten races with Burton returning as its driver. The new car made its 2006 debut at Richmond. Burton finished in the top ten seven out of the ten times the car raced in 2006, including a win at Dover in June. Burton started 36th after qualifying was rained out, and passed Kurt Busch with 18 laps to go. In 2007, the No. 29 went full-time and, like the No. 21 several years before, Childress set out to win the owners' championship for a second time without a full-time driver. Burton and Scott Wimmer, who had just lost a Monster Energy NASCAR Cup Series ride due to lack of sponsorship, shared the No. 29 with Holiday Inn sponsoring. Burton won five times including the finale at Homestead and Wimmer put together several strong finishes in his time in the car, and Childress had his second Busch Series owners' championship in which no full-time driver raced for the team. Stephen Leicht's car at Milwaukee in 2009. Holiday Inn signed a multi-year extension near the end of 2007, with Scott Wimmer signing on for 23 races, and Burton filling out the rest. The new deal also brought on branding from Holiday Inn Express, which included commercials featuring Burton. Burton had two poles, but also had two DNFs and went winless in 13 starts. Wimmer, meanwhile had a pole at Bristol and 13 top 10s. This included a win at Nashville, where he went by teammate Clint Bowyer with 21 laps to go to take the victory. Wimmer left the team following the 2008 season. The 2009 season saw a change in driver lineup for the No. 29 team. Longtime driver Jeff Burton was joined by Cup teammate and 2008 Nationwide Series Champion Clint Bowyer, as well as up and comer Stephen Leicht. Bowyer's championship crew chief Dan Deeringhoff also moved from the No. 2 team over to the 29 for all three drivers. After seeing Burton's name on the window of the car during a photoshoot (Burton being the longest tenured in the 29), the three drivers entered into a competition between each other: whoever could score the most wins in the 17 races between February and July would have their name placed on the car for the remainder of the season, including the other drivers appearances. Burton was set to drive 7 events in the first half of the season, Bowyer in 6 events including the opener at Daytona International Speedway, and Leicht at four standalone events. The drivers did not have as much success as anticipated; Bowyer scored the team's only two wins (the 2nd races at both Daytona and Dover), Burton had 10 top 10s but only two top 5s, and Leicht had 6 top 10s in nine total starts with a best finish of 6th (twice). Burton also made his 300th career Nationwide Series start at Charlotte Motor Speedway in May. After 2009, RCR shut down the team after Holiday Inn pulled its sponsorship. Max Papis at Road America in 2013. For 2012, the No. 33 car was transferred to RCR to run for the owners championship. 2011 champion Tony Stewart drove the No. 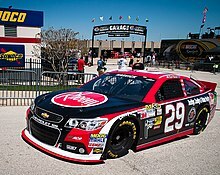 33 with sponsorship from Nabisco's Oreo and Ritz brands at the season opener in Daytona. Kevin Harvick ran 13 races with South Point, Pinnacle Foods, Hunt Brothers Pizza and AdvancePierre Foods sponsoring, Brendan Gaughan drove for 10 races with South Point sponsoring, Menard ran for 7 races, and Max Papis drove at Road America, both with sponsorship from Menards and Rheem. Harvick would be the only driver to win in the No. 33, winning at Richmond and Texas. The No. 33 car returned in 2013 mainly driven by Harvick and Ty Dillon. Tony Stewart would take the No. 33 team to victory lane at the season opener at Daytona, which was marred by a last lap incident. The No. 33 team would take its second and last win of the season with Harvick at Atlanta. Dakoda Armstrong ran Fontana with sponsorship from WinField. Paul Menard, Max Papis, Truck series driver Matt Crafton, and Ryan Gifford all took turns driving the car with MENARDS sponsorship. In 2014, Menard returned to the car for a few races, scoring a win at Michigan. Rookie Cale Conley drove several races with OKUMA and Iraq and Afghanistan Veterans of America sponsoring. Paul Menard after winning at Road America in 2015. For 2015, Austin Dillon, Menard, and Brandon Jones shared the ride with sponsorship from Rheem and Menards. Menard scored a win in August at Road America in his native Wisconsin, taking the lead on pit strategy and holding off Ryan Blaney. For 2016, Brandon Jones will run full-time, competing for Rookie of the Year. Menards and Nexteer Automotive will sponsor the effort. Mike Hillman, Jr. was named the crew chief for the team. Jones had a dismal season. On November 17, 2017, it was announced that RCR is down sizing to three teams in 2018, shutting down the 33 and 62 team after the 2017 season. Brendan Gaughan's winning car at Road America in 2014. In 2014, Brendan Gaughan and crew chief Shane Wilson moved up from the Truck Series to the Nationwide Series, bringing family-owned South Point Hotel, Casino & Spa and longtime number 62 with him. The team used the owners points of the No. 33 team from 2013; the No. 33 scaled back to part-time. Gaughan scored his first career Nationwide win at Road America in June, after struggling early and sliding off the track on several occasions, but gaining an advantage as downpours forced the competitors to switch to treaded rain tires. When pole-sitter Alex Tagliani ran out of fuel before a Green-White-Checkered finish, Gaughan assumed the lead and fended off Chase Elliott and a hard-charging Tagliani (on fresh slick tires). Brendan dedicated the win to his late grandfather Jackie Gaughan. Gaughan scored his second win of the season at Kentucky in September, passing teammate Ty Dillon on the final restart. Gaughan scored a total of seven top tens to finish eighth in points. Gaughan and South Point returned for 2015. At Richmond in May, two pit crew members from the 62 team were injured in a fire when fuel from a malfunctioning gas can ignited. The next week, Gaughan was involved in a crash at Talladega that sent the 62 car spinning down pit road, injuring two crew members from Biagi-DenBeste Racing. Gaughan's best finish of the season was a runner up at California. Gaughan returned for 2016. Gaughan did not get back to victory lane in 2016 but scored 4 top 5s and 16 top tens throughout the season including a 2nd place at Road America(the site of his first win). Brendan Gaughan and South Point returned for the 2017 season, but he failed to score a victory after running solidly all year. However, on November 17, 2017, it was announced that RCR is down sizing to three teams in 2018, shutting down the 33 and 62 team after the 2017 season. Tim George, Jr. in 2012. For 2012, RCR took over the No. 2 truck of KHI that won the Owners Championship in 2011. The truck was split by Tim George, Jr. running 12 races with Applebee's sponsoring, with a best finish of 9th, Brendan Gaughan in 7 races with a best finish of 2nd, and Harvick at both Martinsville races and Dover, winning at the spring Martinsville race. George, Jr. was set to run another partial season in 2013, but he decided to move to Wauters Motorsports instead. Austin Dillon ran the No. 2 truck at Eldora in 2014 with sponsorship from American Ethanol. Jay Sauter in 1997, running the classic GM Goodwrench scheme. In the infant years of the CWTS (then known as the SuperTruck Series), RCR fielded its own truck team, the No. 3 Goodwrench Chevy. 37-year-old driver Mike Skinner was signed to drive the truck for the 1995 season. Skinner won the series' inaugural race at Phoenix International Raceway, passing Winston Cup driver Terry Labonte on the final lap of the race. He went on to win eight races, and won the series first championship by a 126-point margin. Skinner won eight more races and finished third in points in 1996. Skinner scored a total of 16 wins and 15 poles over two seasons. After he left, Jay Sauter hopped on board, winning four times and finishing in the top 10 in points all three years. He was the last driver to win for RCR in the NASCAR Truck Series, until July 11, 2010, when Childress's grandson, Austin Dillon, won the Lucas Oil 200 at Iowa Speedway. After 1999, Childress moved the program up to the NASCAR Busch Series. Third-generation driver Ty Dillon at Rockingham in 2012. The truck team returned during the 2009 season as the No. 3 Chevrolet Silverado driven by Childress's grandson, Austin Dillon for the inaugural race at Iowa Speedway. Dillon would start 9th and finish 12th despite an early spin. In 2010, Dillon drove the No. 3 truck full-time sponsored by Bass Pro Shops. Austin won an impressive 5 poles, 2 wins (Iowa and Vegas), and had 15 top tens en route to a 5th-place finish in the championship and the 2010 ROTY award. In 2011, Dillon drove the No. 3 truck to two wins at Nashville and Chicago, winning the championship over Johnny Sauter. After winning the Truck Series championship, Austin moved up to the Nationwide Series, passing down the No. 3 truck to his brother Ty Dillon for 2012. Ty would take his first win at Atlanta and nearly won the championship at Homestead before crashing while battling Kyle Larson. Ty finished 4th in standings. In the 2013 WinStar World Casino 350K, Dillon won the 100th victory in NASCAR for a No. 3. Ty Dillon returned to the No. 3 truck with Bass Pro Shops for the dirt race at Eldora in 2014. After the Eldora race, Austin Dillon then won with the No. 3 at Pocono, with Yuengling as a sponsor. In 2013 RCR purchased the No. 39 owners points from RSS Racing to field the truck for Austin Dillon in the inaugural Mudsummer Classic at Eldora Speedway, with sponsorship from American Ethanol. Dillon led a race-high 63 laps, and won after a green-white-checker finish. The truck, the trophy and the famed piece of dirt track are on display at the NASCAR Hall of Fame. The No. 39 owners points were then sold back to RSS Racing. Childress' second truck entry debuted in 2011 with Joey Coulter behind the wheel of the No. 22. Coulter stayed consistent throughout the year, having the least DNF's among all other rookies. Coulter would eventually prevail over Nelson Piquet, Jr. and Parker Kligerman to win Rookie of the Year. Coulter would get his first win in the Pocono Mountains 125 at Pocono Raceway, his first win in 36 attempts in the Camping World Truck Series. For 2013, Truck Series veteran Brendan Gaughan drove the truck, now numbered 62, for the full season. Gaughan would come close to finding victory lane on multiple occasions, scoring 10 top 5s and 13 top 10s to finish 7th in points. Gaughan and the No. 62 team moved up to the Nationwide series in 2014. RCR has featured a strong development program since the 1990s that has groomed several NASCAR regulars, most notably 2014 Monster Energy NASCAR Cup Series Champion Kevin Harvick and Richard Childress' own grandsons Austin and Ty Dillon. Other notable former development drivers include Johnny Sauter, Mike Skinner, Timothy Peters, John Wes Townley, Joey Coulter, and Ryan Gifford. RCR fielded a 31 car in the ARCA Racing Series in 2006, with Kevin Harvick Incorporated driver Burney Lamar running three races and RCR development driver Timothy Peters running one. The car returned in 2007 in six races, with Peters, Alex Yontz, and Tim McCreadie, scoring three top ten finishes. In 2008, Austin Dillon ran the full Camping World East Series (now K&N Pro Series East) schedule in the No. 3 Garage Equipment Supply Chevrolet. Initially driving for Andy Santerre Motorsports, Dillon moved under the RCR umbrella after four races. Dillon scored a win in his series debut at Greenville-Pickens Speedway (after Peyton Sellers winning car was disqualified) and finished second in points. Dillon also ran a single ARCA Racing Series event at Rockingham Speedway, finishing seventh in the No. 31 Chevrolet. The 3 car ran five East Series races in 2009 sponsored by longtime RCR partner Mom N' Pops, with Austin Dillon running two races and brother Ty Dillon running three. Ryan Gifford ran four races in the East Series in the 29 Shell/Pennzoil Chevrolet with 3 top 10s, and made one start in the West Series. Austin also ran three ARCA races in the No. 31, with two second-place finishes. Kyle Grissom, son of Steve Grissom, drove the car at Rockingham to a 16th-place finish. Ty Dillon ran eight of the ten K&N East Series races in 2010, scoring a win at Gresham Motorsports Park. Dillon also ran three ARCA races, scoring two victories in the No. 41 Chevrolet. The team also fielded the No. 31 Chevy full-time in ARCA for Tim George, Jr., finishing 9th in points with five top 10 finishes. Dillon moved full-time in the ARCA Series in 2011 along with George, Jr. Dillon won the ARCA championship with an impressive seven wins and seven poles. George improved to 7th in points and scored a weather-shortened win at Pocono. ECR Engines, also known as ECR Technologies and formerly Earnhardt-Childress Racing Technologies, is the engine department for Richard Childress Racing, located on the RCR campus in Welcome, North Carolina. The company builds Chevrolet engines for RCR and several teams in the NASCAR Cup Series, Xfinity Series, Truck Series, and ARCA Racing Series. It also produces engines for all Cadillac DPi-V.Rs in the IMSA WeatherTech SportsCar Championship series. Current ECR clients include Richard Petty Motorsports, Germain Racing, StarCom Racing, Spire Motorsports, Beard Motorsports, Kaulig Racing, Action Express Racing, Wayne Taylor Racing, Juncos Racing, and JDC-Miller Motorsports. Former clients included Furniture Row Racing, Chip Ganassi Racing, JTG Daugherty Racing, Tommy Baldwin Racing, and Leavine Family Racing. The partnership was formed in May 2007 as a cooperation between Dale Earnhardt, Inc. and Richard Childress Racing to develop and build common engines for the Chevrolet NASCAR Cup Series and Xfinity Series teams campaigned by the two companies. The partnership was inherited in 2008 by Earnhardt Ganassi Racing, following the merger between DEI and Chip Ganassi Racing. At the time, the Nationwide Series (now Xfinity Series) and Truck Series engine departments were located at the DEI facility in Mooresville. The company is now known as ECR Engines, no longer connected with DEI or CGR. In 2016, the company became a wholly owned subsidiary of RCR. RCR also holds technical alliances with several teams, including Germain Racing, Richard Petty Motorsports, and StarCom Racing in the Cup Series, as well as Kaulig Racing in the Xfinity Series. Under these relationships, RCR provides engines, equipment, and technical support. RCR's first alliance model was in the mid-1990s as RAD, an aerodynamics program shared with DEI and Andy Petree Racing. RCR previously held a successful alliance with Furniture Row Racing, JTG Daugherty Racing, Leavine Family Racing, and GMS Racing. Following the 2007 Daytona 500, the paint scheme of Kevin Harvick's winning No. 29 car infuriated NASCAR fuel supplier Sunoco, particularly the large Shell Oil logos on the car and team uniforms. Harvick had also worn his Shell firesuit during the Busch Series race he won the day before. Sunoco believed its exclusive rights to provide fuel to the sport also gave them exclusive marketing rights to gasoline, with other companies' limited to marketing secondary products such as motor oil. The 29 team altered its paint scheme the following week with smaller Shell decals, and larger emphasis of co-sponsor Pennzoil. It is to note that Sunoco sponsored Billy Hagan's race team from 1989 to 1992 with Sterling Marlin and Terry Labonte while Unocal 76 was the fuel supplier. Shell/Pennzoil remains in the sport with Team Penske's No. 22. The 31 car without AT&T or Cingular logos at Bristol in 2007. Jeff Burton's firesuit at the race. Meanwhile, AT&T had repeatedly requested that NASCAR allow them to advertise the AT&T Mobility brand on the No. 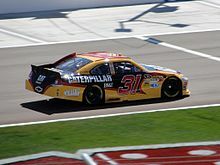 31 car following their merger with Cingular Wireless, but NASCAR refused to allow it, citing the Sprint Nextel contract. Cingular and Alltel (the sponsor of Team Penske's No. 12) had been grandfathered in when NEXTEL entered the sport in 2004, with the drivers wearing white NEXTEL Cup Series logos on their fire suits, but the change in ownership of the former led Sprint to contest the sponsorship. After trying and failing to get NASCAR to approve the addition of the globe logo to the rear of the car, AT&T filed a lawsuit against NASCAR on March 16, 2007. On May 18, a federal judge ruled that AT&T should be allowed to replace the Cingular logos with AT&T logos, and said that AT&T was likely to win the lawsuit. The AT&T logo ran on the No. 31 at the NASCAR NEXTEL Cup All-Star Challenge on May 19 and every race afterwards until NASCAR ordered the sponsorship off before the 2007 Sharpie 500. RCR and Jeff Burton went a step further, with Burton showing up in a logo-less firesuit, and the black and orange car ran without Cingular or AT&T logos. A settlement before the Chevy Rock and Roll 400 was made where AT&T Mobility could sponsor the car until the end of 2008. ^ McFadin, Daniel (December 14, 2018). "Richard Childress Racing reveals Daytona 500 cars, sponsors and Xfinity details". NBC Sports. Retrieved December 15, 2018. ^ a b c d e f Hinton, Ed (September 7, 2001). "Childress In Robby Gordon's Corner". Sun-Sentinel. Retrieved June 24, 2016. ^ a b c Bruce, Kenny (December 11, 2013). "DILLON TO DRIVE NO. 3 SPRINT CUP CAR FOR RCR". NASCAR.com. Concord, North Carolina: NASCAR. Retrieved August 21, 2014. ^ a b Fox Sports (December 11, 2013). "Childress to bring No. 3 back to Sprint Cup with driver Austin Dillon". Fox Sports. Retrieved January 23, 2016. ^ Diaz, George (January 28, 2014). "Family ties bind Austin Dillon to Dale Earnhardt's iconic No. 3". Orlando Sentinel. Charlotte, North Carolina. Retrieved January 23, 2016. ^ NASCAR Official Release (February 21, 2014). "DEEP CLASS TO BATTLE FOR SUNOCO ROOKIE OF THE YEAR". NASCAR.com. Daytona Beach, Florida: NASCAR. Retrieved August 21, 2014. ^ Olsen, Jeff (March 12, 2014). "Austin Dillon finishes ninth in Daytona 500 in No. 3". usatoday.com. Daytona Beach, Florida: USA Today. Retrieved August 21, 2014. ^ Turner, Jared (December 9, 2014). "Exclusive: Austin Dillon -- 'We have to refocus' for 2015 season". Fox Sports. Retrieved January 23, 2016. ^ Turner, Jared (July 31, 2014). "Chasing history: Dillon, Larson in position to reach Chase as rookies". Fox Sports. Retrieved January 23, 2016. ^ "Austin Dillon: 2014 NASCAR Sprint Cup Results". racing-reference.info. Racing Reference. 2014. Retrieved August 21, 2014. ^ a b Jensen, Tom (December 9, 2015). "Austin Dillon's 2015 Sprint Cup Series year in review: One solitary incident will forever define Austin Dillon's 2015 season in the NASCAR Sprint Cup Series". Fox Sports. Retrieved April 2, 2016. ^ "Austin Dillon wins Coca-Cola 600 for first NASCAR Cup victory". The Los Angeles Times. Concord, North Carolina. May 28, 2017. Archived from the original on May 30, 2017. Retrieved May 30, 2017. ^ a b c "AUTO RACING; Earnhardt Buried in Private; His Team Prepares to Race". nytimes.com. Charlotte, North Carolina: The New York Times. February 22, 2001. Retrieved January 7, 2015. ^ Greg Roza (January 2009). Kevin Harvick: NASCAR Driver. The Rosen Publishing Group. p. 14. ISBN 978-1-4042-1899-4. Retrieved June 23, 2016. ^ a b c d e "Harvick gets sponsor". Motorsport.com. Daytona Beach, Florida. February 14, 2001. Retrieved June 24, 2016. ^ Romer, Rich (February 15, 2001). "Childress Racing teams with AOL". Motorsport.com. Retrieved June 24, 2016. ^ "Jeff Green press conference, part I". Motorsport.com. July 25, 2002. Retrieved June 24, 2016. ^ a b c Fryer, Jenna (May 6, 2003). "After Richmond fracas, Childress fires Green". USA Today, Associated Press. Charlotte, North Carolina. Retrieved June 24, 2016. ^ a b Preston, Jen (October 20, 2008). "The Many Feuds of Kevin Harvick Pt. 2: Harvick Takes on His Teammate". Bleacher Report. Bleacher Report. Retrieved January 6, 2015. ^ a b Gray, Nick (June 26, 2014). "Team comes first for Kentuckian Green as 'start-and-park' driver in NASCAR". Kentucky.com. Lexington Herald-Leader. Retrieved October 5, 2014. ^ Dutton, Monte (May 15, 2003). "Steve Park, Jeff Green swap seats in Chevrolets". The Gettysburg Times. Retrieved April 2, 2016. ^ Coffey, Wayne (July 13, 2003). "SPEED BUMPS L.I. 's Park on road back after injury detour". Daily News (New York). Joliet, Illinois. Retrieved April 2, 2016. ^ "Sauter to drive No. 30 for RCR". motorsport.com. motorsport.com. December 12, 2006. Archived from the original on January 6, 2015. Retrieved January 6, 2015. ^ "Sauter to drive #30 AOL Chevrolet in 2004". crash.net. crash.net. 2004. Retrieved August 24, 2014. ^ a b c "Burton moves to RCR, Edwards steps up". motorsport.com. August 13, 2004. Archived from the original on December 22, 2015. Retrieved December 22, 2015. ^ Burton, Chuck (August 12, 2004). "J. Burton leaves Roush, joins Childress in No. 30 ride". USA Today. Welcome, North Carolina: USA Today, Associated Press. Retrieved August 24, 2014. ^ "Jack Daniel's Enters into Sponsorship with Richard Childress Racing for 2005 NASCAR NEXTEL Cup Series; No. 07 to Replace No. 30 in '05". Business Wire. New York. December 3, 2004. Retrieved April 2, 2016. ^ a b c "Jack Daniel's to Conclude NASCAR Program: Brown-Forman brand to end formal relationship with RCR's No. 07 team after 2009 season". Brown-Forman. Louisville, Kentucky. September 21, 2009. Archived from the original on December 17, 2009. Retrieved March 26, 2016. ^ a b Newton, David (September 21, 2009). "RCR unsure of sponsor for No. 07 car". ESPN.com. Charlotte, North Carolina. Retrieved March 26, 2016. ^ Picci, Aimee (September 25, 2009). "Jack Daniel's, Jim Beam lose their NASCAR spirits, race out of their deals". DailyFinance. Retrieved March 26, 2016. ^ a b Jenkins, Chris (August 15, 2010). "Richard Childress Racing looking at expanding again". The Spokesman-Review. Brooklyn, Michigan. Retrieved March 26, 2016. ^ Richard Childress Racing (August 12, 2010). "RCR 2011 driver, sponsor news 2010-08-11". motorsport.com. Welcome, North Carolina: motorsport.com. Retrieved September 26, 2014. ^ Richard Childress Racing (February 22, 2011). "Paul Menard race report". motorsport.com. motorsport.com. Archived from the original on January 3, 2015. Retrieved September 26, 2014. ^ Team Chevy (August 1, 2011). "Chevy Teams Indianapolis Race Notes, Quotes". motorsport.com. Indianapolis Motor Speedway: motorsport.com. Archived from the original on January 3, 2015. Retrieved September 26, 2014. ^ Indianapolis Motor Speedway (August 1, 2011). "NASCAR's Winning Team Indianapolis Press Conference". motorsport.com. Indianapolis Motor Speedway: motorsport.com. Archived from the original on January 3, 2015. Retrieved September 26, 2014. ^ Associated Press (August 4, 2011). "Paul Menard wins Brickyard 400". ESPN.go.com. Indianapolis, Indiana: ESPN. Retrieved September 26, 2014. ^ Staff report (November 17, 2013). "PAUL MENARD'S CAR CATCHES FIRE, TIRE EXPLODES". NASCAR.com. NASCAR. Retrieved September 26, 2014. ^ "Vide: Paul Menard Explosion on Pit Road - Darlington - 2014 NASCAR Sprint Cup". youtube.com. YouTube, Fox Sports. April 12, 2014. Retrieved September 26, 2014. ^ "2014 NASCAR Sprint Cup Series Paint Schemes - Team #27". jayski.com. Jayski's Silly Season Site. 2014. Retrieved September 26, 2014. ^ Kallmann, David (July 27, 2014). "Crew chief mad after Juan Pablo Montoya wrecks Paul Menard". Milwaukee Journal Sentinel Auto Racing. Indianapolis, Indiana: Milwaukee Journal Sentinel. Retrieved September 26, 2014. ^ Spencer, Lee (September 7, 2014). "Beyond the bubble". Motorsport.com. Richmond, Virginia: Motorsport.com. Archived from the original on April 3, 2015. Retrieved September 26, 2014. ^ "Daniel Hemric to drive the No. 8 in Cup Series debut at Richmond". Fox Sports. March 20, 2018. Retrieved March 21, 2018. ^ Wilhelm, Chase (March 20, 2018). "Hemric to bring back No. 8 in Monster Energy Series debut". NASCAR. Retrieved April 2, 2018. ^ "2018 NASCAR Race Results: Toyota Owners 400". NASCAR.com. NASCAR Digital Media, LLC. April 21, 2018. Retrieved April 28, 2018. ^ "Richard Childress Racing will change the number of its No. 31 Cup car to No. 8. The team had announced in September that Kannapolis native Daniel Hemric would replace Ryan Newman in the seat. The No. 8 has a long history with the Dale Earnhardt family, whose roots are in Kannapolis". ESPN. December 14, 2018. Retrieved December 14, 2018. ^ "NASCAR rookie Harvick wins Cracker Barrel 500". autoweek.com. Autoweek. March 10, 2001. Retrieved January 7, 2015. ^ Turner, Jared (December 25, 2015). "Jeff Burton, Robby Gordon, Ryan Newman highlight the history of the No. 31 car". Fox Sports. Retrieved June 28, 2016. ^ Murrell, Marc (February 17, 2008). "NASCAR and outdoors are natural fit: Realtree Camouflage hooks up with racing". The Topeka Capital-Journal. Archived from the original on August 19, 2016. Retrieved June 28, 2016. ^ "Marcis Set to Retire His Wing Tips". Realtree. July 26, 2001. Retrieved June 28, 2016. ^ a b c d McKee, Sandra (February 13, 1997). "Skinner low man on Daytona pole For rookie, front row, respect aren't same". The Baltimore Sun. Daytona Beach, Florida. p. 1. Retrieved June 28, 2016. ^ McKee, Sandra (February 13, 1997). "Skinner low man on Daytona pole For rookie, front row, respect aren't same". The Baltimore Sun. Daytona Beach, Florida. p. 2. Retrieved June 28, 2016. ^ a b c Lyons, Pete (May 8, 2001). "Forgotten Man? Mike Skinner speaks frankly in the wake of the Dale Earnhardt tragedy". Autoweek. Retrieved June 24, 2016. ^ a b McGee, Royce (January 30, 2001). "McGee is no stranger to the No. 31 team". ESPN.com. Retrieved June 28, 2016. ^ a b c d e f Harris, Mike (September 26, 2001). "Surgery ends Mike Skinner's season". Argus-Press, Associated Press. Google News. Retrieved June 28, 2016. ^ "Q&A: Mike Skinner and Robby Gordon". Crash.net. August 2001. Retrieved June 24, 2016. ^ Cingular Wireless (August 15, 2001). "Cingular Wireless to Team With Richard Childress Racing In 2002 Winston Cup Series". PR Newswire. Retrieved June 24, 2016. ^ "Childress Racing releases NASCAR driver Mike Skinner". Autoweek. August 19, 2001. Retrieved June 28, 2016. ^ Fryer, Jenna (August 16, 2001). "Gordon still awaiting explanation for fire". USA Today Motor Sports. Concord, North Carolina: USA Today, Associated Press. Retrieved September 26, 2014. ^ a b "Robby Gordon Bumps And Wins". MRN.com. Loudon, New Hampshire: Motor Racing Network. November 23, 2001. Archived from the original on December 5, 2014. Retrieved September 26, 2014. ^ "Ryan Newman to replace Jeff Burton at Richard Childress Racing - NASCAR". Sporting News. September 9, 2013. Retrieved November 18, 2013. ^ "Quicken Loans Moving to RCR With Ryan Newman". ABC News. September 25, 2013. Retrieved September 25, 2013. ^ "Childress promotes Daniel Hemric to Monster Energy Series, No. 31 ride". NASCAR. September 28, 2018. Retrieved September 28, 2018. ^ "Richard Childress Racing will change the number of its No. 31 Cup car to No. 8. The team had announced in September that Kannapolis native Daniel Hemric would replace Ryan Newman in the seat. The No. 8 has a long history with the Dale Earnhardt family, whose roots are in Kannapolis". ESPN.com. December 14, 2018. Retrieved December 14, 2018. ^ Staff, SPEED SPORT (February 1, 2019). "Tyler Reddick To Enter Daytona 500 For RCR". SPEED SPORT. Retrieved February 1, 2019. ^ McKee, Sandra (April 23, 2004). "Childress' car may put K. Earnhardt on track: Car owner's Chevy gives driver leg up at Talladega Auto Racing". The Baltimore Sun. Welcome, North Carolina. Retrieved November 21, 2016. ^ Zenor, John (April 16, 2004). "Kerry Earnhardt again strives for racing stardom". Peninsula Clarion, Associated Press. Birmingham, Alabama. Retrieved November 21, 2016. ^ a b "RCR's No. 33 gets more races". Winston-Salem Journal. Winston-Salem, North Carolina. April 5, 2012. Archived from the original on January 27, 2013. Retrieved April 20, 2012. ^ Richard Childress Racing (January 26, 2012). "RCR adds Daytona 500 car for Sadler". motorsport.com. Welcome, North Carolina: motorsport.com. Archived from the original on October 10, 2014. Retrieved September 15, 2014. ^ a b c Richard Childress Racing (January 26, 2012). "Gaughan to race limited schedule with RCR". motorsport.com. Welcome, North Carolina: motorsport.com. Archived from the original on October 10, 2014. Retrieved September 15, 2014. ^ a b Moody, Dave (March 30, 2012). "Team Owner Joe Falk Set For NASCAR Return". Godfather Motorsports. Retrieved June 29, 2016. ^ a b Long, Dustin (May 22, 2016). "Sprint Cup owner sues fellow owner, seeks NASCAR charter". NBC Sports. Statesville, North Carolina. Retrieved March 23, 2016. ^ "Scott finishes 27th in Sprint Cup debut". Idaho Statesman. October 13, 2013. Retrieved October 14, 2013. ^ "BRIAN SCOTT TO DRIVE IN DAYTONA 500 WITH RCR". NASCAR. January 7, 2014. Retrieved January 7, 2014. ^ Richard Childress Racing (February 26, 2014). "Brian Scott finishes 25th in first Daytona 500 race". motorsport.com. Daytona Beach, Florida: motorsport.com. Retrieved September 15, 2014. ^ Ford Racing (March 23, 2014). "Ford California - Aric Almirola accident quote". motorsport.com. motorsport.com. Archived from the original on October 6, 2014. Retrieved September 15, 2014. ^ Knight, Chris (May 3, 2014). "Brian Scott earns first Sprint Cup pole at Talladega". motorsport.com. Talladega, Alabama: motorsport.com. Retrieved September 15, 2014. ^ Spencer, Lee (July 4, 2014). "Labonte is back in the saddle with Circle Sport". motorsport.com. motorsport.com. Retrieved September 15, 2014. ^ Richard Childress Racing (August 26, 2014). "Ty Dillon set to make his NASCAR Cup debut at Atlanta". motorsport.com. motorsport.com. Retrieved September 15, 2014. ^ Pennell, Jay (May 3, 2015). "Brian Scott's spin leaves Michael Waltrip with nowhere to go". foxsports.com. Talladega, Alabama: Fox Sports. Retrieved June 2, 2015. ^ "Ty Dillon Joins Nickelodeon Racing Team at Kansas Speedway". rcrracing.com. Richard Childress Racing. May 5, 2015. Archived from the original on May 7, 2015. Retrieved May 5, 2015. ^ Wilson, Steve B. (May 31, 2015). "Late On-Track Accident Shortens Brian Scott's Day at Dover International Speedway". speedwaydigest.com. Speedway Digest, RCR PR. Retrieved June 2, 2015. ^ Staff Report (April 28, 2015). "TY DILLON PICKS UP PRIMARY SPONSOR FOR MICHIGAN". nascar.com. NASCAR. Retrieved May 5, 2015. ^ Pockrass, Bob (March 29, 2011). "Austin Dillon to make Sprint Cup debut at Kansas or Phoenix in Mike Curb-owned car". Sporting News. Fontana, California: Sporting News. Archived from the original on October 10, 2014. Retrieved September 30, 2014. ^ a b "Harvick Having A Banner Year In ACDelco Car". ACDelco. Grand Blanc, Michigan: ACDelco. October 20, 2000. Archived from the original on February 7, 2015. Retrieved February 7, 2015. ^ a b Associated Press (September 22, 2004). "Robby Gordon put on probation by team". USA Today. Welcome, North Carolina. Retrieved June 30, 2016. ^ "Clint Bowyer Named Driver of the ACDelco Chevrolet for RCR". ACDelco. Huntersville, North Carolina: ACDelco. April 6, 2004. Archived from the original on April 3, 2015. Retrieved January 7, 2015. ^ a b c NASCAR (November 21, 2008). "Champions' Week Thursday report". motorsport.com. Orlando, Florida: motorsport.com. Archived from the original on January 7, 2015. Retrieved January 7, 2015. ^ ACDelco (October 19, 2006). "BUSCH: RCR No. 2 sponsor withdraws". motorsport.com. Grand Blanc, Michigan: motorsport.com. Archived from the original on January 7, 2015. Retrieved January 7, 2015. ^ Richard Childress Racing (October 28, 2009). "Forsyth Tech Renames its Motorsports Program Richard Childress Race Car Technology at Forsyth Tech". Welcome, North Carolina: motorsport.com. Retrieved December 4, 2015. ^ "Adversity aside, now he's living life in the fast lane". Lowell Sun. August 22, 2009. Retrieved February 2, 2016. ^ Williams, Deb (September 9, 2011). "Kevin Harvick Inc. Is Done With NASCAR Racing". Racin' Today. Richmond, Virginia: Racin' Today. Retrieved August 24, 2014. ^ a b c d Gluck, Jeff (December 6, 2012). "Brian Scott shores up Richard Childress Racing NASCAR lineup for 2013". SB Nation. SB Nation. Retrieved August 24, 2014. ^ Newton, David (September 7, 2012). "Elliott Sadler leaving RCR". ESPN.go.com. Richmond, Virginia: ESPN. Retrieved August 24, 2014. ^ Associated Press (September 7, 2013). "Brad Keselowski wins at Richmond". ESPN.go.com. Richmond, Virginia: ESPN. Retrieved August 24, 2014. ^ Pockrass, Bob (April 27, 2013). "Nelson Piquet Jr. kicks Brian Scott in groin during argument following Nationwide Series race". sportingnews.com. Richmond, Virginia: Sporting News. Retrieved August 24, 2014. ^ "Brian Scott Wins NBC12 Qualifying Pole Award for Tonight's ToyotaCare 250 NASCAR Nationwide Series Race: Scott led the way with a speed of 122.061 mph (22.120 sec)". rir.com. Richmond, Virginia: Richmond International Raceway. April 25, 2014. Retrieved August 24, 2014. ^ Associated Press (July 19, 2014). "Brian Scott wins pole for Nationwide race". USA Today. Joliet, Illinois: USA Today. Retrieved August 24, 2014. ^ a b Bruce, Kenny (January 6, 2015). "SEASON PREVIEW: BRIAN SCOTT". nascar.com. NASCAR. Retrieved January 7, 2015. ^ a b Spencer, Lee (November 18, 2014). "Scott extends partnership with Richard Childress Racing". motorsport.com. Miami: motorsport.com. Archived from the original on January 7, 2015. Retrieved January 7, 2015. ^ a b Broomberg, Nick (November 4, 2011). "Austin Dillon to drive No. 3 in Nationwide Series in 2012". sports.yahoo.com. Yahoo!. Retrieved January 7, 2015. ^ a b c Smith, Marty (June 27, 2010). "Dale Jr. ready to stop driving No. 3". espn.go.com. ESPN. Retrieved January 7, 2015. ^ Associated Press (July 3, 2010). "Earnhardt earns first win since 2008". espn.go.com. Daytona Beach, Florida: ESPN. Retrieved January 7, 2015. ^ Associated Press (September 23, 2012). "Austin Dillon sweeps at Kentucky". espn.go.com. Sparta, Kentucky: ESPN. Retrieved January 7, 2015. ^ a b "Austin Dillon clinches 2012 Rookie of the Year Honors in Miami". motorsport.com. Miami Beach, Florida: motorsport.com. November 19, 2012. Retrieved January 7, 2015. ^ Pockrass, Bob (November 2, 2012). "Sponsor expands backing of RCR's Austin Dillon, famous No. 3". Sporting News. Fort Worth, Texas: Sporting News. Retrieved January 7, 2015. ^ Vincent, Amanda (November 16, 2013). "Austin Dillon battles back for 2013 Nationwide championship". motorsport.com. motorsport.com. Retrieved January 7, 2015. ^ Shelton, Joseph (February 8, 2014). "Could Ty Dillon Be the First Nationwide Rookie to Win the Championship?". Bleacher Report. Bleacher Report. Retrieved January 7, 2015. ^ "SUNOCO ROOKIE REPORT: TY DILLON". nascar.com. NASCAR. September 10, 2014. Retrieved January 7, 2015. ^ "NASCAR » Payday brings Harvick back to Busch". crash.net. crash.net. 2003. Retrieved November 13, 2014. ^ "Timken-Sponsored Richard Childress Racing Wraps Up Busch Series Owners Championship". PR Newswire. Canton, Ohio: PR Newswire. November 14, 2003. Retrieved November 13, 2014. ^ a b c Chemris, Thomas (November 17, 2003). "BUSCH: Beating around the Busch, final chapter". motorsport.com. Archived from the original on December 8, 2015. Retrieved September 21, 2015. ^ "Race Gear". Racegear.com. Archived from the original on September 8, 2008. Retrieved November 18, 2013. ^ a b c Gluck, Jeff (May 28, 2010). "A Salute To John Wes Townley, The Chicken Man". SB Nation. Retrieved October 25, 2015. ^ Turnbull, Doug (October 16, 2015). "Townley says win is "affirmation" what he's been doing the last few years". WSB (AM). Archived from the original on October 24, 2015. Retrieved October 25, 2015. ^ a b Richard Childress Racing (August 31, 2010). "RCR, Shepherd form team". Welcome, North Carolina: motorsport,com. Retrieved September 21, 2015. ^ Richard Childress Racing (August 11, 2011). "Tim George Jr. to make 1st Watkins Glen series start". motorsport.com. Retrieved September 21, 2015. ^ a b Staff Report (February 8, 2013). "RCR TAPS DAKODA ARMSTRONG FOR NATIONWIDE STINT". NASCAR. Archived from the original on March 29, 2013. Retrieved September 21, 2015. ^ a b "Dakoda Armstrong gets NASCAR Nationwide ride with Richard Childress Racing". Autoweek. February 8, 2013. Retrieved September 21, 2015. ^ Richard Childress Racing (June 18, 2002). "BUSCH: Milwaukee: Jim Sauter and sons to race". Welcome, North Carolina: motorsport.com. Retrieved September 21, 2015. ^ "TRUCKS: One-on-One with Johnny Sauter". Fox Sports. May 8, 2015. Archived from the original on September 21, 2015. Retrieved September 21, 2015. ^ "MAYFLOWER TRANSIT SPONSORS JEFF BURTON IN NASCAR BUSCH SERIES RACE". prLeap. St. Louis, Missouri: PRLeap. September 21, 2005. Retrieved August 24, 2014. ^ "Holiday Inn Hotels Begins Multi-million-dollar Marketing Campaign that Asks Guests to "Look Again" at the Brand". Hotel Online. Atlanta, Georgia: InterContinental Hotels Group. June 7, 2006. Retrieved August 24, 2014. ^ "Jeff Burton: 2006 NASCAR Busch Series Results". racing-reference.info. Racing Reference. 2006. Retrieved August 24, 2014. ^ "StonebridgeRacing.com 200 results". USA Today. Dover, Delaware: USA Today. 2006. Retrieved August 24, 2014. ^ McConnell, Jim (June 4, 2006). "Burton savors 'unbelievably good' Busch race". fredericksburg.com. Dover, Delaware: Free Lance-Star Publishing, LLC. Archived from the original on August 24, 2014. Retrieved August 24, 2014. ^ DeCotis, Mark (November 18, 2007). "Burton cops owner title for Childress in Busch finale". USA Today. Homestead, Florida: USA Today, Florida Today. Retrieved August 24, 2014. ^ "Holiday Inn Renews With RCR". MRN.com. Motor Racing Network. October 24, 2007. Archived from the original on August 26, 2014. Retrieved August 24, 2014. ^ Associated Press (March 23, 2008). "Wimmer edges teammate to win Nashville Nationwide race". USA Today. Gladeville, Tennessee: USA Today. Retrieved August 24, 2014. ^ "Clint Bowyer Switches to Part-Time Drive with Holiday Inn". autoevolution. SoftNews NET. 2009. Retrieved August 24, 2014. ^ Crandall, Kelly (February 8, 2009). "Richard Childress' Drivers Putting Their Names on the Line". Bleacher Report. Bleacher Report, Turner Broadcasting, NASCAR.com. Retrieved August 24, 2014. ^ Ocker, Kyle (May 19, 2009). "Jeff Burton Making Nationwide History With 300th Start At Lowe's". Bleacher Report. Bleacher Report, Turner Broadcasting. Retrieved August 24, 2014. ^ Cavana, Alan (August 19, 2013). "News: Meet Nascar's Ryan Gifford". BET.com. BET, NASCAR. Retrieved September 28, 2014. ^ "Cale Conley joins Richard Childress Racing's NNS lineup". motorsport.com. February 27, 2014. Retrieved August 12, 2014. ^ "Austin Dillon and Rheem Team for 2015 Xfinity Series". Richard Childress Racing. November 24, 2014. Archived from the original on November 29, 2014. Retrieved November 24, 2014. ^ Staff Report (November 3, 2014). "CHILDRESS TAPS BRANDON JONES FOR 2015 DUTY". nascar.com. NASCAR. Retrieved January 1, 2015. ^ Pennell, Jay (November 24, 2014). "Austin Dillon to run majority of Xfinity Series races with Rheem". Fox Sports. Retrieved July 7, 2016. ^ "Menards to Continue Partnership with RCR's No. 33 NXS Team". Richard Childress Racing. December 18, 2014. Archived from the original on December 19, 2014. Retrieved December 19, 2014. ^ Associated Press (August 29, 2015). "Paul Menard capitalizes on lengthy late caution to win at Road America". ESPN.com. Elkhart Lake, Wisconsin. Retrieved February 6, 2016. ^ "Brandon Jones Becomes a Full-Time Driver at RCR in 2016". rcrracing.com. Welcome, North Carolina: Richard Childress Racing. September 25, 2015. Archived from the original on September 28, 2015. Retrieved September 29, 2015. ^ "Nexteer Automotive Partners with RCR for 2016 NASCAR season". Richard Childress Racing. January 21, 2016. Archived from the original on February 7, 2016. Retrieved February 6, 2016. ^ a b "Richard Childress Racing cutting back to three XFINITY teams in 2018". Espn.com. November 18, 2017. Retrieved January 1, 2019. ^ "Gaughn to Drive Full 2014 NASCAR Nationwide Series Season for RCR". rcrracing.com. Richard Childress Racing. October 18, 2013. Archived from the original on August 19, 2014. Retrieved August 15, 2014. ^ Bonkowski, Jerry (June 21, 2014). "GAUGHAN WINS IN THRILLING FINISH AT ROAD AMERICA". NASCAR.com. Elkhart Lake, WI (Road America): NASCAR. Retrieved August 15, 2014. ^ NASCAR Wire Service (September 25, 2014). "Richard Childress Racing to follow up stalwart showing at Monster Mile". motorsport.com. motorsport.com. Retrieved May 5, 2015. ^ a b c Spencer, Lee (October 23, 2014). "Gaughan's NASCAR campaign continues with Richard Childress Racing". motorsport.com. motorsport.com. Retrieved May 5, 2015. ^ a b DeGroot, Nick (May 5, 2015). "Crew member removed from pit lane at Talladega for failing to wear protective gear". motorsport.com. motorsport.com. Retrieved May 5, 2015. ^ Spencer, Lee (April 28, 2015). "NASCAR reviewing Richmond inferno". motorsport.com. motorsport.com. Retrieved May 5, 2015. ^ Caraviello, David (January 16, 2013). "RCR shuts down part-time Truck Series team". NASCAR. Retrieved January 23, 2013. ^ a b c d Sharp, Seth (July 30, 2014). "Remember When: Mike Skinner and the Truck Series Arrives". Popular Speed. Retrieved June 28, 2016. ^ Spencer, Reid (November 1, 2013). "Ty Dillon claims 100th win for No. 3 at RCR". NASCAR. Retrieved November 8, 2013. ^ a b NASCAR Wire Service (August 13, 2013). "NASCAR Hall of Fame unveils Austin Dillon's winning truck from historic Camping World Truck Series dirt race at Eldora". The Republican (Springfield, Massachusetts). Retrieved February 6, 2016. ^ Gelston, Dan (July 25, 2013). "AUSTIN DILLON WINS ON DIRT AT ELDORA". Associated Press. Rossburg, Ohio. Retrieved February 6, 2016. ^ "Car number 31 in 2007: ARCA Racing Series Results". racing-reference.info. racing-reference.info. 2007. Retrieved February 18, 2015. ^ "ES: Austin Dillon 2008 sponsor announced". motorsport.com. Las Vegas: motorsport.com. October 31, 2007. Retrieved February 7, 2015. ^ Courchesne, Shawn (April 22, 2008). "Austin Dillon Declared Winner In Camping World East Series Debut". blogs.courant.com. Hartford Courant. Archived from the original on February 9, 2015. Retrieved February 7, 2015. ^ "Ryan Gifford". Hometracks.NASCAR.com. NASCAR. 2014. Retrieved September 28, 2014. ^ a b McCubbin, Ashley (November 5, 2010). "Richard Childress' Grandson, Ty Dillon, To Run Full 2011 ARCA Series Schedule". Bleacher Report. Bleacher Report. Retrieved February 7, 2015. ^ Richard Childress Racing (December 2, 2009). "Richard Childress Racing signs Tim George Jr". motorsport.com. Welcome, North Carolina: motorsport.com. Archived from the original on February 7, 2015. Retrieved February 7, 2015. ^ "Dillon Crowned 29th ARCA Racing Series Champion at Series' Annual Championship Awards Banquet". arcaracing.com. Covington, Kentucky: Automobile Racing Club of America. December 10, 2011. Retrieved February 7, 2015. ^ "Tim George Jr. Wins Fog-Shortened Pocono 200". arcaracing.com. Long Pond, Pennsylvania: Automobile Racing Club of America. June 11, 2011. Retrieved February 7, 2015. ^ a b c d "ECR TECHNOLOGIES NOW A DIVISION OF RCR ENTERPRISES". NASCAR com. Welcome, North Carolina: NASCAR Digital Media, LLC. August 5, 2016. Retrieved August 5, 2016. ^ a b c d "RCR & DEI to Build Engine Program Together". Richard Childress Racing. RCR PR. May 18, 2007. Archived from the original on November 5, 2007. Retrieved July 28, 2007. ^ "Clients". Richard Childress Racing. Retrieved December 15, 2018. ^ Press Release (February 4, 2015). "ECR Engines Promotes Richie Gilmore from COO to President". Welcome, North Carolina: Catchfence.com. Retrieved December 4, 2015. ^ Pockrass, Bob (November 2, 2012). "Earnhardt Ganassi Racing switching to Hendrick engines for 2013". Fort Worth, Texas: Sporting News. Retrieved December 4, 2015. ^ "DEI, Ganassi link up for future title chase". motorsport.com. motorsport.com. November 14, 2008. Archived from the original on September 13, 2014. Retrieved September 13, 2014. ^ "About ECR". Earnhardt Childress Racing Engines. ECR. Archived from the original on April 3, 2010. Retrieved May 10, 2010. ^ DeGroot, Nick (August 5, 2016). "Earnhardt Childress Technologies now entirely owned by RCR". Motorsport.com. Archived from the original on August 8, 2016. Retrieved August 5, 2016. ^ Wolkin, Joseph (April 14, 2015). "Spencer Gallagher rising through the ranks". motorsport.com. motorsport.com. Retrieved June 14, 2015. ^ Moody, Dave (January 13, 2014). "CONFIRMED: Coulter To Trucks With GMS Racing". motorsports-soapbox.blogsport.com. Godfather Motorsports, Blogspot. ^ Pedley, Jim (May 12, 2011). "Furniture Row Racing Has Overcome Mountains". RacinToday.com. Retrieved December 4, 2015. ^ Cain, Holly (September 27, 2015). "FURNITURE ROW WILL FIELD TOYOTA CAMRYS IN 2016". NASCAR. Retrieved September 27, 2015. ^ "Furniture Row Racing Feeling Upbeat About RCR Alliance, Early Results". Furniture Row Racing. Denver, Colorado. March 10, 2010. Retrieved March 26, 2016. ^ Smith, Michael (February 22, 2007). "Shell Game: Sunoco Upset With Logos On Harvick's Fire Suit". Sports Business Journal. Sports Business Journal. Retrieved November 13, 2014. ^ a b Coble, Don (March 1, 2007). "Sprint Nextel, Sunoco flex their muscles as NASCAR series sponsors". savannahnow.com. Savannah Morning News. Archived from the original on December 15, 2014. Retrieved November 10, 2014. ^ Silva, Jefrey (March 19, 2007). "Cingular-Sprint Nextel quibbles spill onto NASCAR racetrack". Crain Communications. Archived from the original on March 28, 2007. Retrieved November 27, 2015. ^ "Metro Atlanta Business News". Archive.is. Retrieved January 1, 2019. ^ Barber, Pete (September 12, 2007). "NASCAR, Sprint Nextel reach agreement with AT&T on branding dispute". The Westmoreland Journal. Google News. Retrieved June 24, 2016. Wikimedia Commons has media related to Richard Childress Racing.